This review was written by Graham Benson, who is the organiser of the Convention. Thanks Graham! I don’t think I’m the person to write this, but I will attempt to give an unbiased view of the weekend. If you were at the convention please feel free to add your experience to this. For me the Friday started by the arrival of one of the acts Peter and Jochen. Next task was putting up the signs to help you get to the venue. During this I got a phone call from the security, they had turned up early to do a recky. “Graham there are some people putting up a tent at the hall” they said “I think they’re Scandinavian”. As I was in the area I went to investigate. It was three Germans that had turned up on an early flight. They had decided to pitch a tent on the waste ground opposite the hall to keep out the snow. I offered them the choice of coming back to my place or they could put the tent up in the wee garden of the hall. They moved the tent to the garden. I later got two phone calls about them, one was to check who they were the other was a neighbour suggesting we should let them in before they froze to death. By 6.30 pm people had started to arrive. The music was on, the coffee was made and we started to just chat and do a little juggling. This laid back feeling was to continue throughout the weekend. Some went off to the off-licence and brought in their carry outs, others enjoyed the tea, coffee and biscuits put out by the organisers. The second of the star acts arrived, Max. When he had settled in, Max, Peter and myself did some passing. I learnt a new trick so I was happy with the juggling side of the convention. As the night, sorry morning, got later some were thinking of sleeping places. Gandalf was keen on there being a music off time. I asked every one to shout when the wanted the music off: 2 am, 3 am, 4 am, 5 am, 6 am – no one wanted the music off so I left it to the last one standing to turn it off. Gandalf decided to head back to my house to sleep. The three acts found a spot on top of a large cupboard to sleep. They put down the crash mats and turned it into the pent house. (they were offered a bed). I left to get some sleep. started (as well as the tea and coffee). The hall gradually got cleared of the rubbish and bodies. And people made their way up to halls 1,2 and 3 to find the juggling space and traders. A tight rope was set up in the work shop hall. Some in our club now want one for us to keep. Work shops then started to happen but in a very informal way. At 4 pm the 24 hour hall was cleared to set it up for the show and give the acts a practice before the evenings event. To change the hall I had made a large saltier for a back drop. The sound man set up his equipment and went off to get the lights. The other halls were cleared about 6.30 is for a 7 pm start to the show. The show went well with only one or two technical hitches, sound man not returning with his lights until the show had started, and the fuse blowing in the interval. I was asked to do the compering, and did some magic between each act. The acts conceded of a mixture of local jugglers, conventioneers and the two acts brought up with the assistance of New Circus Initiative. The show opened with Jock and Geordie from Stirling doing an escapology act. Geordie handcuffed and chained was put into the double duvet of death. He was given 3 minutes to escape or he would be pummelled to death by a wee girl with a pillow. To make it more dangerous a teddy bear with a flatulence problem was put in the duvet as well. The next act was a young lady of 13 (looked 17-18ish) called Zoe in a body stocking painted in u.v paint dancing to Michel Jackson. The paint on her was in an underwater motif and was the result of the body painting workshop given by Rick Mills (the green man) earlier that day. This was followed by Andy, a Glasgow juggler doing some contact juggling. I was told something about a flag in the ball, but from were I was I could not see it. Later I saw the video and wow there was a reflection of the saltier in the crystal rolling up and down his arms. The penultimate act of the first half was the Georgini Diabolo Project. George from Stirling performed a very lively act with his Diabolo concluding with throwing up two Diabolo’s skipping then catching them. I know he was worried about the height of the ceiling , but he pulled it off first time. The first half was drawn to a conclusion with a double act doing some simple passing and ending with knocking out a cigarette from the victims mouth. Oh! that was me and Charles. The second half was opened by Bridget and Andy club/poi swinging to some ravy type music. One of the agents present was so impressed they approached Bridget to see if they could use her for some bookings. This was followed by another Glasgow act Jamie with a funky devil stick routine. He had a bit of a problem with the sound track at the start so everyone started to sing “if your happy” until the music started to play. Light were dropped for the next act Charles and his glow in the dark balls. This superb routine was performed to “It can only get better”. Well it did, the next act was Peter and Jochen form Bristol with a very slick bouncing ball routine and a table. The show was brought to an end with Max up from London. 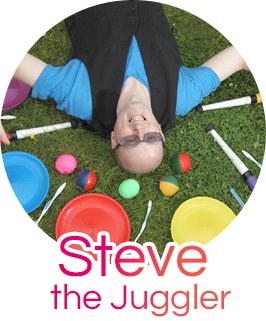 He started his act with some contact juggling then broke into ball juggling. The whole routine flowed with a mixture of dance and acrobatics. The show turned out better than I had expected but you should read the opinions of others who were there. Between the show and dancing we had a raffle. Every one got a strip of tickets for coming. And those who helped got extra strips. The raffle was drawn by Gandolf, all prizes were donated by, Beards, Wind Things, Tactical Magic, Crosslands Bar, the local Indian take a way, Fuzzy, Val, and the convention’s only t shirt. We brought the very full day to a close with a ceilidh. The band Rerr Terr set up and started to play. The first dance the Gay Gordon’s was a couples dance. The passes for the convention were playing cards two sets were used one for the blokes one for the girls. You had to find you partner card for the first dance. This got the jigging of to a fine start and went on till 2 am. In the middle we had a haggis supper (yes all the haggis was eaten and we even had veggie haggis). I staggered home not long after the ceilidh ended. On the Sunday the campers in the 24 hr hall woke to the smell of bacon frying and coffee wasping though the hall. “Anyone want bacon rolls” shouted Marie and heads popped out of sleeping bags, Sunday breakfast was enjoyed with the Sunday papers. The jelly forgotten from last night was even put out, and the lot scoffed. The jugglers made there way up to the halls juggled some workshops were done, but I don’t know how many. At 3 pm the games and haggis juggling took place in the 24 hr hall. Charles got two of the records and Stefan from Germany got one. There are now new world records for juggling 1lb haggis. Set at Glasgow 2002. It turned out harder than we had thought, but that makes it more of a challenge. We will be doing it again next year so if you would like to be a record holder start to practice now. Believe it or not ALL the haggis were eaten. These were top class haggis supplied by Campbell prime meats of Broxburn. They gave us the haggis for the Ceilidh as well as for the juggling records and there was none left at the end of the night. The convention did not have the feel of a convention, it was more like, a laid back party. Thanks to all that made it so.See you next year at the Scottish. Find out about more Scottish Juggling Conventions.